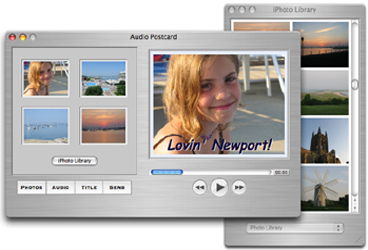 Welcome to the Home of Audio Postcard by nFinity, Inc.
nFinity The software your digital photos have been waiting for! With Audio Postcard you will easily create and send custom digital postcards over the Internet complete with embedded audio messages, custom titles, and borders. Works in conjunction with your digital photo library including iPhoto on the Mac and My Pictures folder on Windows. Imagine being on vacation and sending super cool audio postcards to your friends and family. Step 1. Drag photos into position. Step 2. Record your voice message. Step 3. Add border and title. Ideal for corresponding with family, friends, and business associates! Products are available for either Windows or Macintosh operating systems and QuickVoice is also available for the iPhone. QuickVoice and Voice Stickies products and names are copyrights© and trademarks of nFinity, Inc.